Showcase your brand, attract new customers and affirm your company’s competitive edge by exhibiting at COLLABORATE 19. This impactful event for the Oracle user community allows exhibitors to reach more than 5,000 potential customers. This conference focuses on helping Oracle users maximize their Oracle products and prepare for tomorrow’s technology strategies. Take advantage of this important opportunity to powerfully position your brand at the COLLABORATE 19 Exhibitor Showcase. Interested in exhibiting at COLLABORATE 19? Learn more about the showfloor space, important dates and times and other key logistical information from FREEMAN to help make your showfloor experience as smooth as possible. Download our Exhibitor Marketing Kit for conference logos, website banners, social media information and more to help you promote your COLLABORATE presence to your customers. Exhibit Hall Hours – Extended Hours for 2019! Maximize your brand’s power by continuing to expand your partnership with Quest! 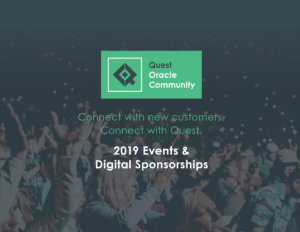 Our prospectus speaks to many of Quest’s 2019 event and digital sponsorship opportunities! I am a vendor or booth staff. Can I play Quest-opoly? Can I take other booth’s tchotchkes? How can I plan to scan badges? Where do I get my lead retrieval? Something is wrong with my booth once I am onsite, where can I find Freeman? Can I go to other vendor’s sessions? Am I allowed to scan my session? I’m having problems with the A/V in my session room. Where do I need to go? Can I tear down earlier than what’s outlined for vendor teardown? I have an Exhibit Hall Only badge, what does that mean? Can we hand things out as the show floor doors open and customers are walking into the show floor? How many people can we staff at our booth? Quest-opoly is a game-like traffic-driving opportunity that is available for purchase outside of your contracted exhibit space inclusions. The coupon booklet is distributed to all Quest COLLABORATE customers onsite. Each participating vendor has one dedicated page in the book which indicates your company name, booth number and prize giveaway. Attendees will return entries to your booth prior to the Quest-opoly deadline for submissions. Vendors will draw a winner. Winners will be announced in an email to all COLLABORATE attendees. If you opted in to participate in Quest-opoly through your contract, you will be contacted leading up to COLLABORATE to gather information for your page. If you would like to participate, please email [email protected] for more information and details. I am a vendor or booth staff member. Can I play Quest-opoly? Unfortunately, no. This is a customer-only experience and promotion. Vendors and exhibitors are not eligible to win prizes intended for customers. We also ask that you avoid taking giveaways, tchotchkes or other items without the consent from that respective vendor. We ask that you avoid taking giveaways, tchotchkes or other items distributed at COLLABORATE without the consent of the booth staff offering that item. Be respectful to your fellow exhibitors and their materials. COLLABORATE attendee badges will have QR codes printed on the front for scanning. These QR codes require the ATS conference affiliated scanners to read them. Please see the Freeman Kit for information to order your ATS scanner. ATS (American Tradeshow Services), our official lead retrieval vendor, will have a desk in the Exhibit Hall onsite. Exact location will be updated and sent to exhibitors prior to COLLABORATE 19. Something is wrong with my booth when I arrived onsite. Where can I find Freeman? FREEMAN, our official service contractor, will have a desk in the Exhibit Hall onsite. Exact location will be updated and sent to exhibitors prior to COLLABORATE 19. Can I go to another vendor’s education session? Exhibitors or vendors with a full conference badge have access to education sessions. However, we ask that you do not attend your competitor’s sessions out of respect and confidentiality. Any session speaker or sponsor can ask a vendor to leave their session. If you have an Exhibit Hall Only badge, you may only attend sessions that your company is sponsoring. Am I allow to scan my session? Vendors themselves are not allowed to scan any educational sessions including VAS (Vendor Awareness Sessions). This is to prevent any unauthorized individuals from scanning a session. Quest will have temp staff onsite to scan all sessions. We do not release scan counts or any data from traditional educational sessions, even those with vendors as presenters or co-presenters. We will send out post-show scans from any VAS sessions you have purchased from Quest. These will be distributed within two weeks after the show ends. Please find the temporary staff or Quest staff in your education hallway and report the problem. We will radio A/V to assist ASAP. As a best practice, we stop in before every session to make sure the presenters are squared away. No. Exhibits are to be kept intact until the closing of the show. No part of an exhibit shall be removed during the show without special permissions from Show Management. Any Exhibitor who dismantles their display early may lose the privilege of exhibiting at future COLLABORATE shows or may lose their company’s priority status in booth selection. Exhibit Hall Only badges are for employees of your company working your booth. These passes include access to all evening receptions as well as lunch on the Exhibit Hall Monday, Tuesday and Wednesday. These passes DO NOT have access to education sessions. The ONLY exception is if your company is presenting a session, you may attend that presentation(s). Can we hand things out to customers that are walking in as the exhibit hall doors open? Distributing items to attendees when the Exhibit Hall doors open is a sponsorable opportunity. Show management will facilitate the distribution of items. Anyone found doing this will be asked to cease and desist immediately and materials will be confiscated. If you are interested in sponsoring our door “Grab N Go”, please contact [email protected].